IAM Local 1943 member and Ohio Army National Guard Cpl. 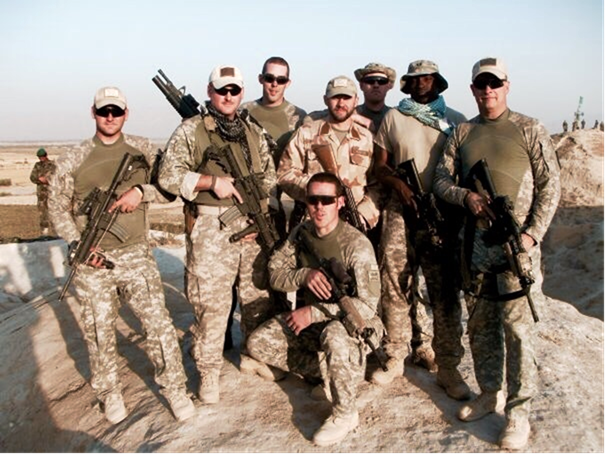 John Riley, standing on right, and his squad from the 174th Air Defense Artillery Brigade attached to the 48th Infantry Brigade in Afghanistan. “It’s a term everyone has used, but I truly know what it means,” said Riley, a member of Middletown, OH Local 1943. 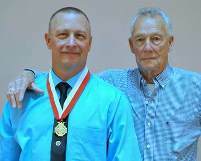 Riley and his father, John, after being inducted into the Ohio Military Hall of Fame for his actions during an ambush in Afghanistan while supporting Operation Enduring Freedom in 2009. In 2009, more than five hours away from the nearest U.S. troops, Riley was one of 26 U.S. and Afghan soldiers on a reconnaissance patrol between two forward observation bases in rural Afghanistan. They were ambushed. Riley sprang into action, dismounting from his position to render first aid to wounded members of the Afghan National Army. Then, exposed to intense enemy fire, Riley directed the shots of his gunner. The firefight lasted more than an hour. “The important thing is we took 26 men out, and all 26 came back with us,” said Riley. Riley, an IAM safety coordinator at AK Steel in Middletown, is credited with saving the lives of his fellow soldiers. He was awarded the Army Commendation Medal with Valor and most recently, inducted into the Ohio Military Hall of Fame. Riley hadn’t told his family or friends about his actions in Afghanistan, or that he had been decorated by the Army. Riley himself was surprised to be inducted into the hall. He says he wasn’t aware of its existence until receiving a phone call notifying him that he was to be honored. Are you an IAM veteran? We want to hear from you! Fill out this form to stay in touch with us about veteran’s resources.